(1) The geometry function y is dependent on the crack dimension (shape and size), the boundary dimensions of the surface of the surrounding material and the stress pattern in the region of the crack path. (2) This information can be obtained from finite element analyses of the detail using crack tip elements. The stress intensity for different crack lengths is calculated using the J integral procedure. Alternatively it can be calculated from the displacement or stress field around the crack tip, or the total elastic deformation energy. (3) Published solutions for commonly used geometries (plain material and welded joints) are an alternative source of y values. Standard data are often given in terms of Y where Y = yn"0'5. A typical example for a surface breaking crack in a plain plate is shown in Figure.B.4.1 .a. 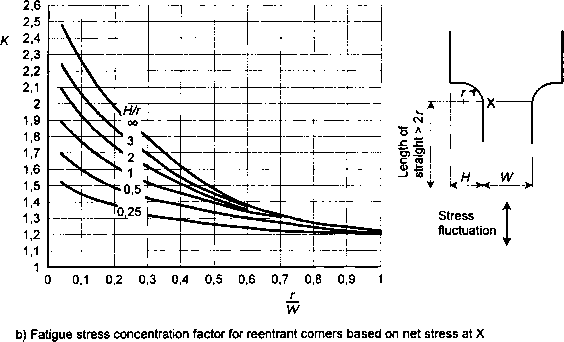 If the crack is located at a weld toe on the plate surface then a further adjustment for the local stress concentration effect can be made using the magnification factor MK (see Figure.B.4.1 .b). (4) The product of Y for the plain plate and MK for the weld toe gives the variation of y as the crack grows through the thickness of the material (see Figure.B.4.1 .c). (5) For further information on published y solutions see References B.8.1, B.8.3 and B.8.5.